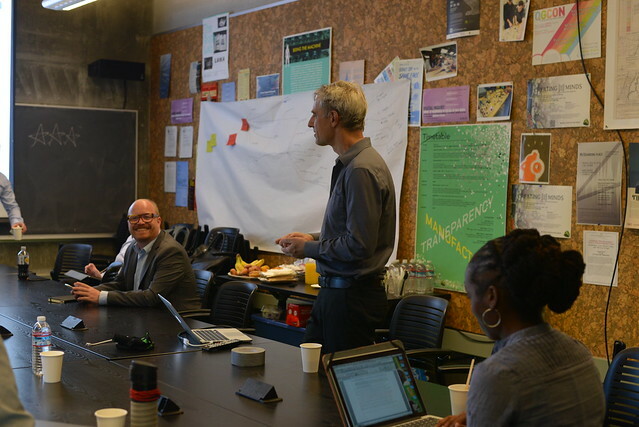 The Berkeley Center for New Media was delighted to host the Cultural Committee from the Danish Parliament on June 28, 2016. The Committee visited the Bay Area to gain insight into current developments in the digitization of culture and media in the United States. Observing a cooperation between businesses, non-profit organizations, and authorities of culture here, the Committee was interested to learn about opportunities and challenges digitization affords. Before touring the campus' design and invention spaces, we presented three reflections on these topics. Director Greg Niemeyer's talk "Affinity over Identity: New Dynamics in Contemporary Culture" discussed the qualitative shifts in the production, mediation and reproduction of culture caused by changes in social dynamics and technical possibilities. He questioned whether technical advances drive socio-cultural changes or whether socio-cultural changes produce the need for technical advancement, referencing archives, database design, sensor technologies, and identity politics. Michael Wolfe, Executive Director of the local non-profit education and advocacy organization Authors Alliance, presented on "Fostering Innovation," through mass digitization. Michael explored how to weigh the need for widely available information and cultural touchstones with artists' and producers' rights through the lens of current legal reforms around digitization. BCNM DE Grace Gipson then concluded the conversation with "Imagining a Black Future through #Afrofuturism." Grace explored how #Afrofuturism has evolved as a way to continue imagining what the African diasporic future might look like through the worlds of art, film, literature, music and beyond through the arena of social media. Touching on various uses of #Afrofuturism, Grace exhibited how it functions as a digital storytelling tool that allows Black users a space for social, cultural, and political empowerment in and outside the social media network.